Mullery auctioneers is currently offering for sale Number 389 Tirellan Heights. This dormer style semidetached residence is situated in a mature and well-established development. 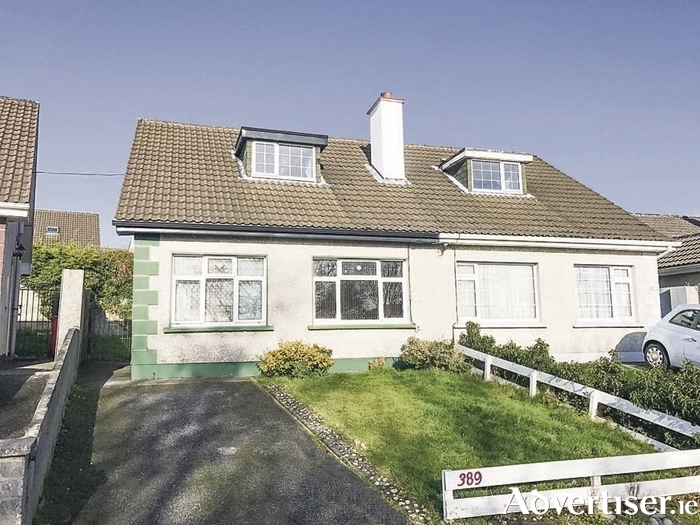 The property is situated adjacent to a green area and national school and within a short walk of Galway Shopping Centre, Galway Retail Park, Terryland Retail Park, Dunnes Stores Terryland, the Menlo Park Hotel, and the Maldron Hotel. There is a bus stop situated within minutes’ walk of the property. Originally a four bedroom residence, it is now laid out as a three bedroom and includes a store room on the first floor which could be converted to a bathroom, en suite, or study. The accommodation comprises entrance hall, living room, kitchen, dining room, three bedrooms (one with walk-in wardrobe ), bathroom, and store room. Outside, there is a lawn and driveway to the front, and to the rear is an extremely private garden with lawn, patio, and shed. This property would make an ideal home in a convenient location and would also be suitable as an investment opportunity with strong demand for rental accommodation in the area. For further details and viewings contact Mike Mullery of Mullery auctioneers on 091 567275 or 087 6424106.